The Smoketree School abounds with colorful geniuses but we have not been able to claim an aristocratic all-star equivalent to a Thomas Moran or Albert Bierstadt. Thanks to the Palm Springs Art Museum and Sullivan Goss Gallery in Santa Barbara, we now have a candidate for this position in the early desert painter Lockwood de Forest. An exhibit of his works opens December 17th, 2011, at the Palm Springs Art Museum, with a members’ preview on December 16th. Catalogue available at Palm Springs Art Museum store. Book produced by Sullivan Goss Gallery. See gallery website for ordering information. 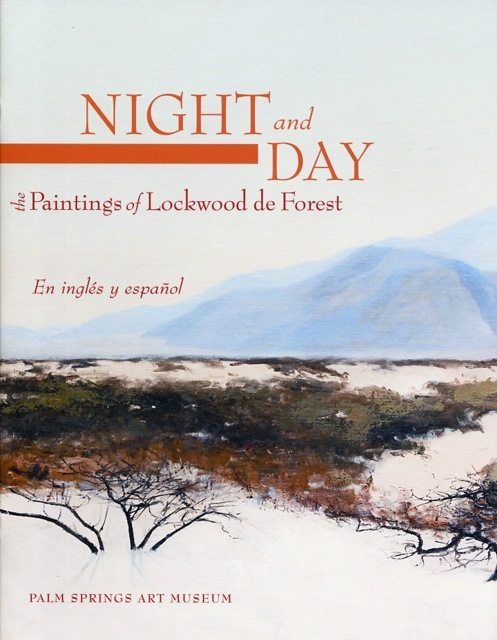 De Forest was a prolific artist and his medium of choice was the plein air oil sketch. While few large oil canvases have surfaced, a substantial number of oil sketches—over three thousand—have survived, largely preserved by the artist’s descendants. Filled with scenes of de Forest’s world travels, these sketches comprise a visual journal of his relentless passion for capturing the atmosphere and natural landscape of the places he visited. De Forest’s membership in the New York’s exclusive National Academy links him with some of America’s greatest and most prestigious painters including Thomas Cole, Frederic Church (his mentor and cousin), Albert Bierstadt, Thomas Eakins and Winslow Homer, yet he is an artist that remains largely overlooked and perhaps better remembered for his decorative arts and association with Louis Comfort Tiffany. We are confident that this exhibition of plein air paintings, chronicling de Forest’s extensive world travels, will generate renewed interest and appreciation in this important American artist. Lockwood de Forest, courtesy of Sullivan Goss gallery. 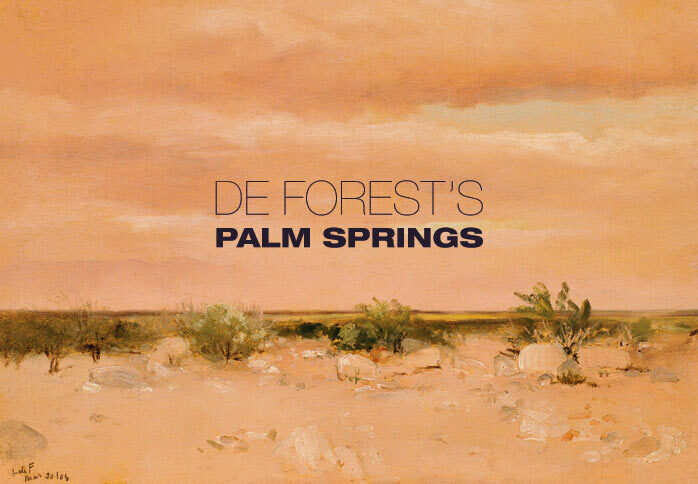 Between 1904 and 1918, de Forest made at least ten documented painting tours to the Palm Springs area. While his paintings of the Palm Springs area were likely not the first to be painted (the earliest oil painting of Palm Springs is thought to be an 1875 painting by Carl D. Brown [1849-1914] currently held in a private collection), research to date indicates they are the first to be painted by an academically trained artist and member of the National Academy. 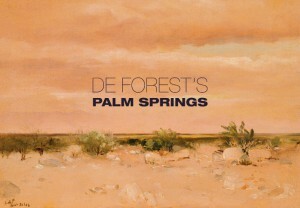 De Forest’s paintings of the Palm Springs and Indio areas are unique and not like later generations of artists that painted in the area. This is likely due to his style of painting that is more connected to the nineteenth century luminists and can be considered a third-generation of the Hudson River School. His studies have a freshness and immediacy that differ from his larger “studio” paintings. While these are small works, the artist considered them “finished”. 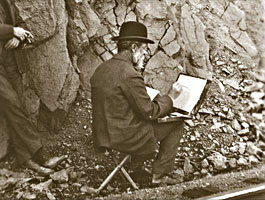 Compare his early paintings of the Middle-Eastern desert with his later paintings of the Palm Springsarea. Look for his limited palette, yet how light radiates from the canvas in both his daylight desertscapes and his darker moonscapes. He was relentless in his desire to capture the subtleties of light and atmosphere. I think it important to compare de Forest’s paintings with the writings of his contemporary–John C. Van Dyke in his book The Desert, first published in 1901. An art historian, Van Dyke employed a highly romantic, colorful and aesthetic vocabulary in his descriptions of the desert region. His writings and those that soon followed (George Wharton James and J. Smeaton Chase, etc.) indicate a cultural shift in attitudes toward the desert. 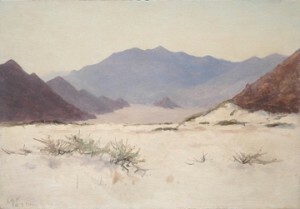 No longer perceived as forsaken wasteland, the American desert began to be viewed as “God’s color showroom” filled with “chromatic colors and enchanting distances,” with an emphasis on its qualities of light and atmosphere—all elements de Forest sought for his paintings.